One of the most important skills a parent can possess is being a good listener. While it sounds pretty simple in theory, many parents (regardless of marital status I might add) have a difficult time putting it into practice. Give children your full attention when they are talking to you. This means turn off the TV or stop putting away the groceries. Sit down and make eye-to-eye contact with your child. If you can’t stop what you are doing, let your child know what they have to say is very important to you. Then arrange a time with your children when you can give them all of your attention. I recommend asking children to wait minutes not hours. Listen to your child without trying to fix, judge, criticize or change their feelings. Typically as parents we have a strong desire to spare our children from unpleasant, hurtful or difficult situations. Since divorce can stir up a lot of those experience we may try to shield our children by fixing the problem or trying to convince them that they really don’t feel that way. Unfortunately our good intentions can be damaging. When children are not allowed the opportunity to solve their own problems or have their feelings acknowledged they are deprived of building both esteem and self-confidence. Also, it may be difficult for children to identify how they feel if they never receive validation of certain feelings. Seek to understand your child’s feelings and perspective. One way we can convey understanding is by focusing on what our child is feeling and verbalizing that feeling for them. Parents can make statements such as ” I can understand why you would feel that way”, “It sounds like you are…” or “That must be really difficult when…”. Also, remember understanding does not mean you agree with another person’s perspective; it only means you understand. Kids need to talk to someone who is supportive and understanding. Taking action doesn’t mean you fix the problem or give advice to your children. Once you feel you understand your child then you can make a decision about how to respond. Sometimes it may mean giving them a hug, other times it may mean having to watch them struggle with a difficult issue or problem. Keep your issues separate from your children’s feelings. Make sure you are utilizing a support system outside of your children to deal with your own feelings. When you find yourself having a strong reaction to something your child has said or is feeling, try to stay focused on your child. If you are finding it too difficult, give yourself time out to process what is going on and how you are feeling about the situation. When necessary, get help or find support. Many of the changes divorce brings can be difficult to deal with for parents. If you or your children are having a hard time dealing with those changes, find support or seek out professional help. If your child doesn’t want to talk…..
For some children talking about divorce makes it feel too real and they may not be ready to accept the fact that life is changing. 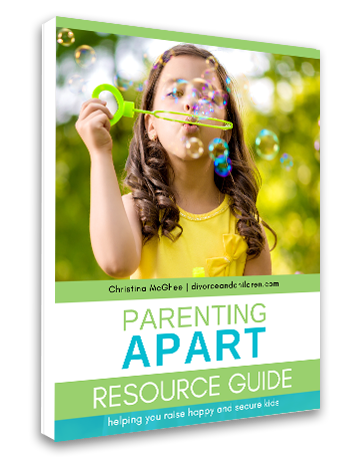 If your child does not want to talk or resists discussions about divorce let them know you understand this is hard for them. You can also tell them you understand that they might not want to talk right now but when they are ready to talk you will be ready to listen. It can also help to look for age appropriate children’s book or videos that address family change. One excellent resource for younger children is the documentary SPLIT, a film for kids of divorce. Often kids find it much easier to talk about a film or book than what’s happening in their own lives. Programs like SPLIT offer an avenue for parents to address some of the tough issues families deal with when Mom and Dad divorce.